Inspirational messages for cancer survivors: Fighting cancer is a battle that is not won just by medicines, chemotherapy and a great team of doctors. Becoming cancer-free also requires a constant stream of strong will power, faith, hope, love and most importantly a positive attitude. Cancer patients who have kicked the disease out of their bodies usually emerge stronger and focus on making every day of their second chance count. If you know someone who has just recovered from cancer, show your support by sending them a dose of motivational from time to time. Their inspirational stories are the stuff miracles are made of. You can be a part of their journey by helping them live life to the fullest. 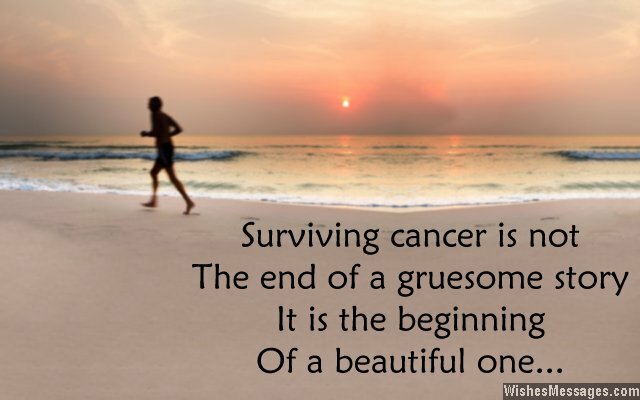 1) Surviving cancer is not the end of a gruesome story. It is the beginning of a beautiful one. 2) You could have given up, but you chose to fight. You chose to beat all the odds. You chose to believe that hope is stronger than reality. You chose to overlook the suffering. You chose to see the light at the end of life’s darkest tunnel. You made all the right choices, you are inspirational. 3) Cancer can defeat medicine but it couldn’t defeat your spirit. 4) Surviving cancer is like winning a war. It makes you realize the real meaning of true freedom in life. 5) Cancer was a subtle reminder that you can’t control everything in life no matter how hard you try. So let go of your worries and enjoy every single moment of the second chance life has given you. 6) Cancer is life-threatening but recovery from it is life-changing. The same chemotherapy that once ruined your life will now give you a fresh new perspective to life. You will have different priorities but one thing will always remain constant – the will the live. 7) The only side effect of surviving and recovering from cancer should be a permanent smile on your face. 8) Your survival isn’t just a personal victory. You are a true inspiration to millions of people who are hoping to beat the odds and come out stronger. 9) Doctors and medicines were just a part of the recovery. What mattered more was your will power and desperation to kick the disease out of your body. 10) The WORST part about enduring cancer is that you see each day as a CURSE. The BEST part of surviving cancer is that you will start treating each and every day as BLESSING. 11) Before cancer: Love your job, laugh with your colleagues, be focused and do all the things you have been asked to. After cancer: Love your family, laugh with your friends, be positive and do all the things you have always wanted to. 12) If you can beat cancer, you can beat anything. Now that you are stronger than cancer, you are virtually invincible. 13) Your recovery is a DREAM COME TRUE for each and every loved one who prayed for you and a HOPE for each and every person who is still facing the gallows of this deadly disease. 14) Nothing is impossible and you have just proved it. 15) The power of a cancer survivor’s smile is a power like no other. Now you have the power to be an icon of HOPE for other cancer patients and a source of INSPIRATION for everyone who thought that their lives were tough. 16) Cancer lost the battle against you because it had originally planned to make you weaker but inadvertently made you stronger. 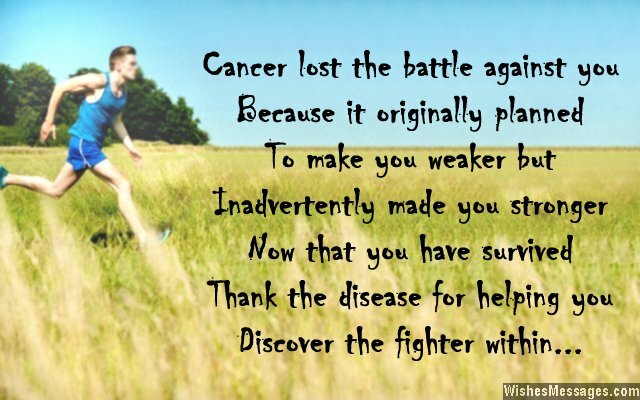 17) Now that you have survived cancer, thank the disease for helping you discovering the fighter within you. 18) Surviving cancer means that you will now constantly seek HAPPINESS, feel GRATITUDE and spread LOVE. 19) Everyone knows what cancer can do but few people like you can show the world what cancer can’t. 20) Surviving cancer is God’s way of telling you that you have had your fair share of suffering. Now it’s your time to lap up all the happiness life can possibly offer. 21) Your battle for survival is a war that was started by cancer but finished by you. 22) It is amazing how just one word can bring smiles to the faces of everyone around you. Before, you said I HAVE CANCER. Now you will say I HAD CANCER. 23) Real courage is not about going headstrong into a fight that you are confident of winning. Real courage is going headstrong into a fight and giving it your best shot despite knowing that you may lose it because the odds are against you. Your willingness to fight cancer – that is what real courage is all about. 24) Surviving cancer isn’t a second chance in your life, it is a new life altogether. 25) Your victory over cancer is hope’s victory over despair and love’s victory over pain. 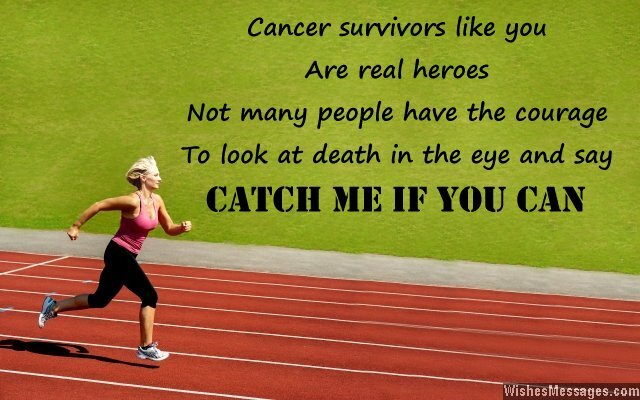 36) Cancer survivors like you are real heroes. Not many people have the courage to look at death in the eye and say ‘catch me if you can’. 27) Your recovery isn’t just a sign of advances in medicines. It is a sign of the most innocent yet the most powerful force known to mankind – hope. Ride on this wave and keep living life to the fullest like you’ve always been. 28) Cancer is a disease that shows you how you can’t completely control how healthy you are. But recovery from cancer will show you how you can completely control how happy you are. 29) Surviving cancer is a reminder to start ticking off all those things from your bucket list. 30) You may have never won the lottery but you have won something much more precious – a second chance at life. Never take another day for granted and live life to the fullest. 31) It is not the fear of death that has helped you survive cancer. It is the fear of not spending more time with your loved ones that helped you claw yourself out of this misery. Remind yourself of this fear every single day and spend every possible moment spreading your love to every single person who stood by your bedside all these years. 32) Remember the people who stood by your bedside all this time when you are struggling with chemo? Congratulations, you have found your real family. 33) Finding out that you are cancer-free can sometimes be more difficult to accept than finding out that you’ve got cancer. Use this sense of disbelief to rid yourself of all the negative emotions and negative people out of your life after surviving cancer. 34) Cancer is just not a word, it is a language altogether. Cancer is not just a disease, it is a life journey. Cancer is not just about recovery by medicines, it is about healing yourself from within. Congratulations for understanding the language of cancer, treading along this torturous life journey and learning how to heal yourself from within. 35) Recovery from cancer will show you that life isn’t about beginnings or endings, it is about enjoying the journey with your friends and loved ones.